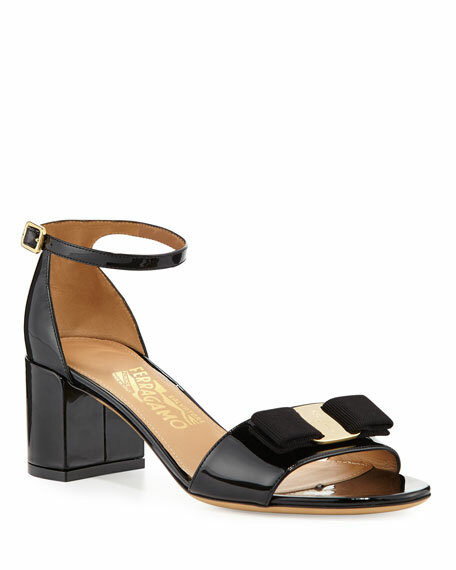 Salvatore Ferragamo "Gavina" patent leather city sandal. Grosgrain Vara bow with golden logo buckle. Salvatore Ferragamo sandals in PVC and rubber. 0.3" flat heel. Open toe. Signature Vara bow at upper. Slide style. Quilted memory foam footbed. Rubber outsole. "Cirella" is made in Italy. Salvatore Ferragamo patent leather sandal with signature metal Gancini detail. 1.3" covered block heel. Strap bands open toe. Adjustable ankle strap. Leather lining and sole. Made in Italy. Salvatore Ferragamo "Gavina" patent leather city sandal. 2.3" covered block heel. Strap bands open toe. Grosgrain Vara bow with golden logo buckle. Adjustable ankle-wrap strap. Lightly padded footbed. Leather outsole. d'Orsay style. Made in Italy. 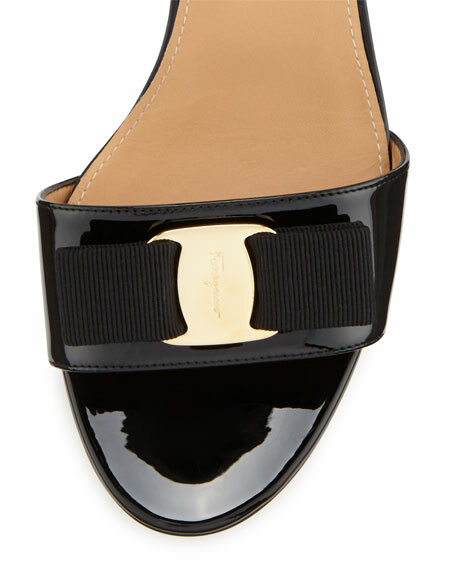 Salvatore Ferragamo patent leather slide sandal. 2" covered heel. Open toe. Signature Vara bow detail. Leather lining and sole. Made in Italy.